Today when going through posts on Creature Comforts blog I found a link to a colour palette generator. 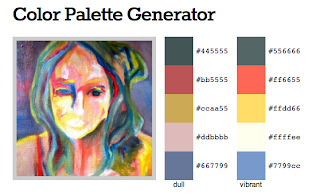 Of course you can you use Photoshop but this generator is much quicker if you try to determine a colour scheme of any image that has been uploaded. It only requires to copy and paste the URL! The downside is that the resulting number of colours generated is limited.